A Thai citizen has been sentenced to 10 years in jail for violating strict laws against insulting the monarchy. A court in Bangkok said Suwicha Thakho, 34, digitally altered images of King Bhumibol Adulyadej and his family and posted them on the internet. Thai officials say more than 5,000 websites have been blocked in the past year for insulting the monarchy. 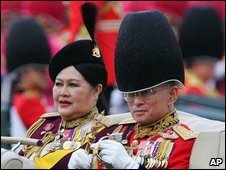 Thailand's royal family is sheltered from public debate by some of the world's most stringent "lese-majeste" laws, as the police and army try to suppress what they fear is a rising tide of anti-monarchy sentiment. One political activist was jailed for six years in November for an anti-monarchy speech she made just a stone's throw from the old royal palace last July. Several other people are awaiting trial. But in February the king pardoned Australian writer Harry Nicolaides, who was sentenced to three years in jail for insulting the crown prince in a little-known book. The 81-year-old king also pardoned a Swiss man who was given a 10-year sentence two years ago for defacing his portrait.